A speaker at a seminar conducted a group activity. He gave each person a balloon. The attendees were then asked to write their name on it using a marker pen. Then all the balloons were collected and put in another room. The attendees were then let into that room and asked to find the balloon with their name written on it within 5 minutes. That descended into chaos – everyone began frantically searching for their name, colliding with each other, and pushing each other around. Very few found their balloon. Then, the speaker asked each person to randomly collect a balloon and give it to the person whose name was written on it. Within minutes, everyone had their own balloon. Companies that rely on winning based on product leadership require top quality R&D labs. These R&D labs allow them to test out various ideas and bring the best of them to the market. The most innovative companies do a great job with sustaining high quality R&D wings. Failure in the market can be very expensive and, thus, not investing enough in research can cost companies who want to be innovative. Just ask any of the pharmaceutical giants. So, let’s apply this to our own company – Me, Inc. How can we go about creating our own R&D labs? The essence of research and development is to think of an idea that you believe will add a lot of value down the line, to find the cheapest and most effective way to test it and then to execute. So, let’s say you believe learning how to build a mobile app will add to your future earning potential. The R&D based approach would be to pick up a book or two on app development, to invest in the necessary app development tools, and to just get started building an app. In some ways, every side project you choose to spend your time on is an example of an R&D lab. The big questions, then, are – are you intentionally thinking about the ideas you want to test/the skills you want to learn? And, are you building an R&D infrastructure that allows you to test different kinds of ideas/skills? 1. A distributed team that wasn’t getting its act together. Thanks to a variety of reasons, we seemed to be struggling to get our act together. On the one hand, after 6 months of attempting to run a charity in addition to all our jobs and commitments, the honeymoon phase was definitely over. On the other, a bunch of us faced disruption in our schedules with fairly valid reasons such as cross continental re-locations. We were struggling though. We seemed to have lost our mojo and our momentum and we needed to gain it back. 2. Troubles with partners. We had a couple of partner situations that were just not working out. We needed to step back and take stock. 3. Legal hurdles. 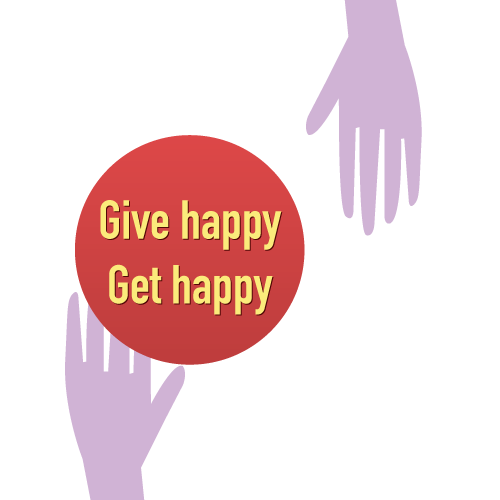 Getting a charity fully functional in India is no easy feat. Despite a solid track record, we were unable to get enough movement on the required legal certificates to receive tax exemption. That’s an ongoing struggle. We had also decided we’d apply for a 501c3 registration in the US as nearly half the team is currently based in the states. All in all, there were a few legal hurdles to jump. 1. We needed a real core team that would keep each other accountable. When we started out, we had a team of 14. Over time, this came down to a more manageable group of 7-8 folks who were actually getting things done. We needed to make this official and begin to create accountability within the team again. So, we did just that. We still keep our whole team copied on emails but we have a separate group on Whatsapp for the core group and we’ve begun expecting each other to show up prepared. A culture of accountability goes a long way. 2. Good managers give their team members clarity on what needs to be done. This was entirely my failing. Over time, I’d assumed that we’d just respond to the sheer magnitude of work by just getting things done. That clearly didn’t happen. Why, I wasn’t doing anything myself. We needed someone to break work down and give people clarity on what to do. I had completely neglected this. So, we spent all of last call aligning on the major projects and priorities and broke up these projects down to granular tasks so we had absolute clarity on what needed to be done. Voila – things have begun moving again. – We want to be authentic about the problems we’re facing. At this point, we just aren’t at the operational level we desire. And, we need to work hard to fix our ship before we share stories of success. The good news is that we’re putting in the work and should have more to share shortly. Does this mean you’re not going to hear from Help2Grow.org? Absolutely not. We will continue to share stories as and when possible. It will just not be a key priority. We’re going to work hard to fix the leaks in our ship and deliver value to the kids and organizations we aim to serve. More to follow soon – just forgive us for the occasional silences. We’ll just plan to make it worth it when you do hear from us. And here’s hoping our actions make a difference.. This blog post has also been posted on the Help2Grow.org blog. Someone recently shared that people stuck in poverty have a lower IQ score on average than those better off. However, this IQ score goes up almost as soon as they know they’re out of their current financial condition. Researchers have posited that this is because a large portion of their mental resources are taken up by questions around requirements at the low end of Maslow’s pyramid. Constantly wondering whether there will be a next meal, whether the roof will hold up for the night or whether they’ll be able to survive their current illness doesn’t leave much mental space for much else. So, if you don’t need to worry about any survival necessities, you ought to know that you’ve just been gifted a whole bunch of IQ points. These IQ points enable us to think long term, build for the future and work towards causes bigger than ourselves. Or, we can just choose to focus on the latest minor setback, the sarcastic comment on Facebook or our envy at an acquaintance’s relative short-term success. We can also choose to give thanks for the 30 odd IQ points we gained out of sheer good fortune of being born in the right place or focus on all those things we don’t have. 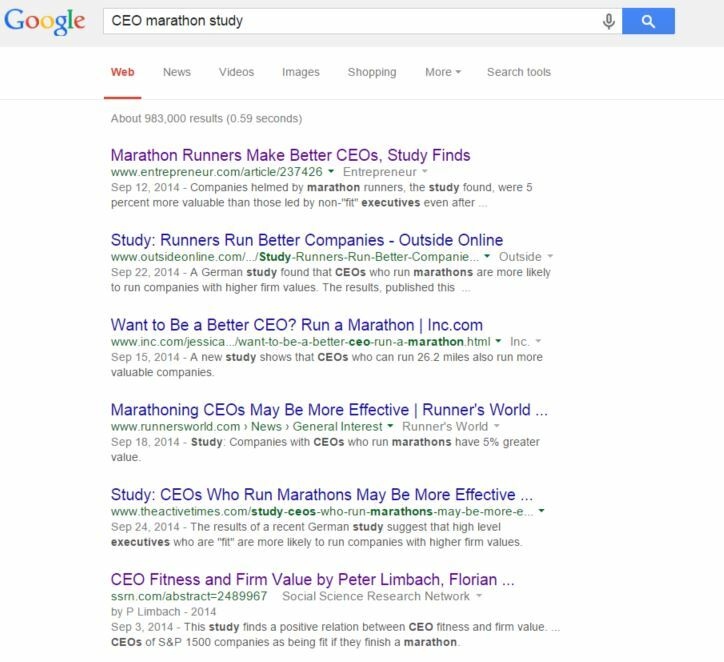 A Google search for “CEO Marathon study” reveals a slew of articles talking about how marathon running CEO’s lead successful companies. The study has been quoted in numerous blogs and articles since it was published. Now, let’s take a closer look at the abstract of the study (the first line will do). This study finds a positive relation between CEO fitness and firm value. For each of the years 2001 to 2011, we define CEOs of S&P 1500 companies as being fit if they finish a marathon. The literature suggests that fitness moderates stress and positively affects cognitive functions and performance. Accordingly, we find the strongest effects on firm value in subsamples where fitness is most important, i.e., for CEOs with high workload, above median age, and above median tenure. Fit CEOs are further associated with significantly higher abnormal announcement returns in M&A bids for large, public, and cross-border targets, concomitant with high stress. Our findings can explain the importance of CEO fitness in the managerial labor market and the trend among CEOs to stay fit. 1. What if CEO fitness does indeed have a positive relation with firm value but, given the absence of other control variables, we don’t realize that it is actually healthy eating that really contributes to firm success? This is a great example of omitted variable bias. 2. There is just a positive relation between CEO fitness and firm value. What if it is high firm value that causes CEO’s to get fit and not the other way around? 3. Are marathons the only way CEO’s mitigate high stress environments? Could Yoga / video games be an option? I have been guilty of not being critical about the identification error multiple times. And, a discussion of this study in our statistics class was a nice wake up call to be more critical about results from studies. Studies that might be published in obscure publications might be obscure for a reason. And, we should worry when we see studies that just find a positive relation between two variables. To illustrate, some researchers in the 1980s concluded that the key to success was to boost self esteem. So, an entire generation of parents and educators focused on boosting self-esteem of kids by giving prizes to everyone and ensuring they always felt encouraged. It was only in the late 90s when a panel of psychologists who reviewed these studies concluded that the researchers had done it wrong. A trait that causes success is self control / high willpower. Kids with high self control inevitably do well and have high self esteem. So, while self esteem might be correlated to success, it is self control that has a causal relationship. There are many such examples. Pay attention. This stuff matters. I have a tried and tested formula for every time I feel overwhelmed. The typical situation begins a long to-do list where everything seems both urgent and important on first glance. It becomes clear that this list of tasks isn’t likely to get done in the time period I have in mind. And bam! I’ve hit that wall. I realized this as I spent 30 minutes this morning attempting to muster enough inspiration for a blog post. My instinct, when I feel stuck, is to motor through. Get the post out, build momentum, get to work. But, after 30 minutes of frustration, it was time to trigger the process to get unstuck. 2. What does a successful day/week/period of time look like? What are 3-5 things I’d like to have done? These questions pointed to a bunch of decisions this morning. Some things needed to be postponed while others needed to be moved up the priority list as they were the chief source of stress. That clarity was all I needed. And, it came from stepping out of the “zone” at a time when it felt like doing so went against all natural instinct. Every employee of the Ritz Carlton has $2,000 to resolve a guest issue without asking for permission. That is unusual. Almost every hotel on the planet likely has a value around customer service. How many actually walk the talk? That said, the Ritz Carlton model would not be sustainable if it didn’t have the systems to back up this unusual policy. If the Ritz Carlton’s systems were a mess, they could easily find themselves spending tens of thousands of dollars every day resolving guest issues. It is this combination of unusual and sustainable that makes the Ritz Carlton special. This idea has numerous applications. Let’s think of personal competitive advantage. If every peer in our company works 60 hours per week, it would be unusual to work 100 hours. But, is it sustainable? How many burned weekends before you realize your productivity has completely dropped? The more important question that it raises is – what are you doing wrong? If everyone else can get their work done in time, why do you need to work so much more? Too often, companies and marketers go for unusual. Giving every viewer on Oprah a car definitely falls under that category. But, if it isn’t sustainable, it is unlikely to be a source of much advantage. Gimmicks like that rely on luck.